The increasing power of computer hardware and the sophistication of computer software have brought many new possibilities to information world. On one side the possibility to analyze massive data sets has brought new insight, knowledge and information. On the other, it has enabled to massively distribute computing and has opened to a new programming paradigm called Service Oriented Computing particularly well adapted to cloud computing. Applying these new technologies to the transport industry can bring new understanding to town transport infrastructures. The objective of our work is to manage and aggregate cloud services for managing big data and assist decision making for transport systems. Thus this paper presents our approach to propose a service oriented architecture for big data analytics for transport systems based on the cloud. 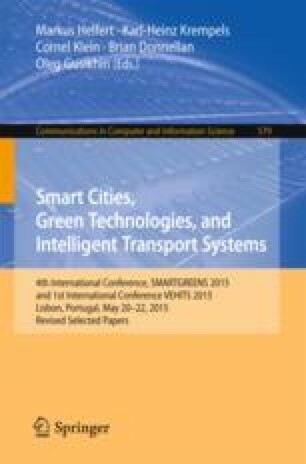 Proposing big data management strategies for data produced by transport infrastructures, whilst maintaining cost effective systems deployed on the cloud, is a promising approach. We present the advancement for developing the Data acquisition service and Information extraction and cleaning service as well as the analysis for choosing a sharding strategy. We thank the Région Rhône-Alpes who finances the thesis work of Gavin Kemp by means of the ARC 7 programme (http://www.arc7-territoires-mobilites.rhonealpes.fr/), as well as the competitiveness cluster LUTB Transport & Mobility Systems, in particularly Mr. Pascal Nief, Mr. Timothée David and Mr. Philippe Gache for putting us in contact with local companies and projects to gather use case scenarios for our work.